Kosmo Quality Management System | Kosmo Machine, Inc. Inspections are a key part of the manufacturing process, ensuring that parts meet customers’ specifications, requirements, and tolerances. For many of our customers, particularly those in the aerospace and other transportation industries, careful review is critical to product safety. For many of our customers, particularly those in the aerospace and other transportation industries, careful review is critical to product safety. 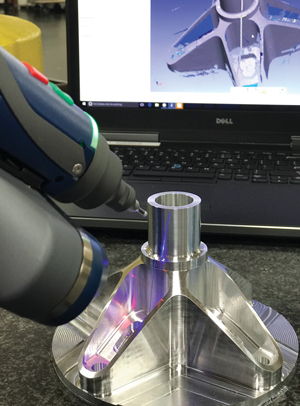 Our FaroArm and other coordinate measuring machines use laser or video probes to collect precise data about a part, which is then measured using the latest software. Using handheld fluorescent x-ray technology, we can verify that each part is of the proper alloy before it is shipped. Parts are magnified and projected upon a screen, where they are measured with up to 50x magnification. 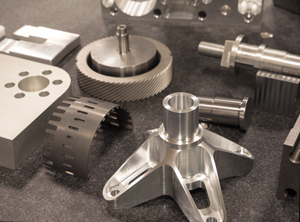 We can create a part based on a customer’s 3D and other renderings, inspect the model, then laser scan the part to confirm it matches the customer’s specifications. As a critical part of ISO certification, all our pins, thread gages, and other gaging undergo regular inspections to ensure they meet NIST standards. Our inspectors review each stage of a part’s manufacturing on the production floor using portable FaroArm CMMs. The result is more efficient production. By applying pressure to a predetermined geometric diamond point, we can test the material’s depth of penetration—the result is confirmation of the required hardness to meet client requirements. Cylinders and other pressure vessels are tested for leaks using this method. First, the component is filled with water, then the unit is pressurized to 1 ½ times the design pressure limit, up to 10,000 PSI. Using laser engraving, we can apply barcodes, batch identification, and artwork or logos to our finished parts.